Marketing is used by all companies, from large Plc. 's too small sole traders, so occasionally, things are can wrong. This series of blog posts will highlight various marketing mistakes, large and small, and how the companies that made these mistakes dealt with the situation they put themselves in. One of the biggest marketing mistakes from all time happens to come from one of the largest companies in the world, The Coca-Cola Company. This marketing disaster occurred in one of the most important times in Coca-Cola's history, when the "coke wars" between themselves and Pepsi Cola was bigger than ever before. Coca-Cola, the worlds no.1 drink, was to be re-released as "New Coke". New branding, new taste and serious faces to promote the brand was to be put into the member of the publics eyes, little did Coke know that they were going to be making one of the biggest marketing mistakes known to man! 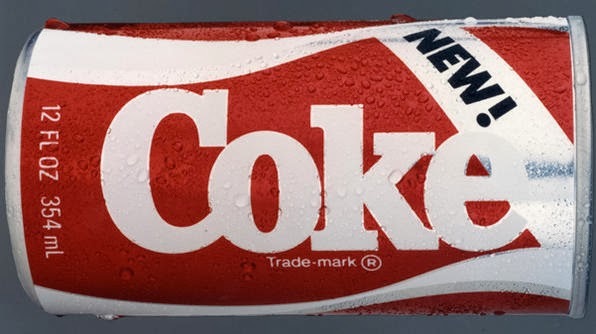 New coke was introduced in 1985 to try and increase Coke's market share, which had been slipping over the past 15 years closer and closer to Pepsi, their nearest rivals. (http://www.coca-colacompany.com/stories/coke-lore-new-coke, 2013). Celebrities such as Bill Cosby were brought in to promote what was meant to be the "new tasting phenomenon"... although this was not the case. By June 1985, The Coca-Cola Company was receiving on average 1,500 calls a day on the consumer hotline, this being compared to the 400 a day before the taste change, showed that Coca-Cola had made a big mistake, some would even say the worse marketing blunder of the century. By July, Coca-Cola announced that the original Coca-Cola would be put back into store's, meaning those who had been rationing their Coca-Cola bottles would be free to start drinking that taste they ever so loved. BUT.... the question by many people is, was this actually a marketing mistake? Since this "marketing epidemic" Coca-Cola have been the leading soft drink in almost every country in the world, as well as "Coke" being the second most used word, second to "OK". New Coke happened to not tingle those Coca-Cola lovers taste buds, but when they decided to bring back the original Coca-Cola, those who loved the product before fell in love right away, and this is the reason why they have continued to be the leading soft drink. Although Coca-Cola got away with this mishap, it does not mean any other company can.